Our evening flight to Bali was delayed so we didn’t arrive until late on Wednesday night. Our travel agent had arranged a VIP Meet and Greet service to guide us through immigration on arrival. Sure enough there was a woman waiting for us as we entered the airport, she took us to a pleasant waiting room and went off to collect our luggage then she steered us through customs and immigration with barely a pause for checks; we could still see other passengers from our plane waiting at the luggage carousel! Outside the airport it was mayhem, cars, buses, taxis and people everywhere but our woman knew exactly where our car was waiting and before we knew it we had been introduced to our Guide Agung, and his driver whose name we never caught, and we were on pour way to our hotel. We spent our first four nights in Bali at the Tandjung Sari hotel on the beach in the holiday resort of Sanur about 30 mins from the airport. We checked in so late we didn’t take much notice of our surroundings, just collapsed into bed pulled the mosquito net around us and fell asleep. Next morning we discovered that our ‘room’ was actually a bungalow set in a private garden with a bale (pergola) for relaxing outside. The big living area had a bathroom with a huge stone bath with a glass wall looking out onto a little courtyard, the shower was out in the courtyard under the thatched eaves, it was lovely starting the day with a shower in the morning sunlight. We found our way through the tropical garden to the restaurant, positioned between the beach and the swimming pool where we opted for the Indonesian breakfast menu, fried rice or noodles with shredded chicken and spicy condiments or rice porridge with chicken soup and …spicy condiments. Delicious. Thursday was a free day so we picked up a map and walked out of the hotel grounds onto the main road through Sanur, it was a jumble of restaurants, cafes, souvenir shops and money changers. There was a lot of traffic and 100’s of scooters going in all directions. We enjoyed wandering although we weren’t in the market for souvenirs, no room in our luggage. Eventually we headed back to the hotel which felt like an oasis of calm and spent the afternoon on the beach and in our bungalow. I spent an hour leafing through a coffee table book about the history of the hotel, published to mark its 50th anniversary a couple of years ago. In its heyday in the late 70’s/ early 80’s it seems this was the place to be, Mick Jagger and David Bowie visited several times along with lots of film stars. The Duke and Duchess of Bedford (who they?) were regular visitors, apparently the duchess asked if the gardeners could remove their shirts when they were working in her garden. On Friday afternoon Agung (and his driver) picked us up and took us to visit Pura Luwur Uluwatu, a temple in a spectacular location on a clifftop overlooking the ocean. Mark had to borrow a sarong before he was allowed to enter then Agung showed us around and explained the history of the temple which was built in the 10th century. About 100meters along the cliff path there was an amphitheatre where every night a performance of a traditional dance takes place. With Agungs hep we got tickets and found seats at the top of the theatre, we were warned to hang on to our belongings because the monkeys in the trees behind us are notorious for pinching things, sure enough a man a few seats along lost his sunglasses. The dance was really interesting and with help from an information sheet we were given we could follow the story of the beautiful princess being kidnapped and then rescued by her husband and an army of monkeys (I paraphrase). 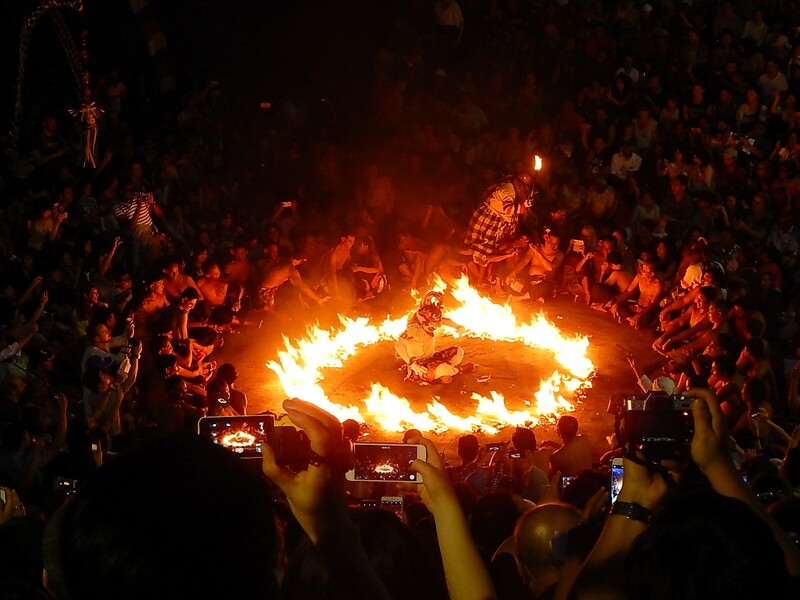 Most Balinese dances are accompanied by a gamelan orchestra, this Kecak dance is unusual because it has a vocal accompaniment from a chorus of 70 men chanting ‘chak-achak-achak’ in different rhythms according to the changing plot, they also represent the forest and palace walls. The dancers were very elegant, the costumes were exquisite and to top it all as the performance progressed the sun set over the sea behind the stage. The final scenes of the dance were very funny with three clown characters interacting with the audience in the front rows, we were nice and safe at the back. Saturday was New Year’s Eve and the hotel was a bustle of activity as the staff got everything ready, we found a little open air library with armchairs and foot stools so we tucked ourselves out of the way to read our books. At 19.30 we wandered down to the restaurant where, after a demonstration of traditional dance by local children, the amazingly friendly and helpful staff served us a delicious four course meal. There was a buffet of starters including shashimi (Japanese raw fish with pickled ginger, wasabi and soy sauce) Indonesian savoury crepes and roasted vegetables. Next they served a mushroom soup, and we chose steak from a selection of four main courses. Finally there was a dessert buffet with pastries, fresh fruit, crème brulee, tiramisu and crepe suzette; and coffee. We were a bit disappointed that they opted for a western menu but it was very good none the less. We ordered a bottle of Prosecco to have with dinner, wine is very expensive in Bali because of import duty but it was New Years Eve after all, it was all we could do to stop the very helpful staff keep topping up our glasses and emptying the bottle before midnight. All evening we were entertained by a very good jazz band who played throughout the meal and then led the countdown to midnight. Just before the countdown the staff handed out cardboard trumpets to everyone and when the clock turned midnight the noise was deafening. There had been fireworks going of intermittently all day but at midnight all the hotels along the bay let rip with fireworks and burning Chinese lanterns floating out over the sea, all the staff came out to the beach to celebrate and the atmosphere was just great. Kim was in her element!